The great feeling of Opening Day was erased by back-to-back losses to the Orioles. The series-opening win over the Tigers was erased by two straight losses featuring blown leads. The weekend sweep of the Orioles to get back over .500 was destroyed by a sweep to the Astros. The Yankees’ season has been two weeks of taking one step forward and two steps back as shown by their disappointing 5-7 record. The bad news is the Rays never lose, and at 10-3, continue to separate themselves from the Yankees with each Yankees loss. The good news is the Yankees are off on Thursday, so they can’t lose. Here are 10 thoughts on the Yankees on this off day. 1. I’m going to reiterate the first thought I had in last Friday’s Off Day Dreaming blog. 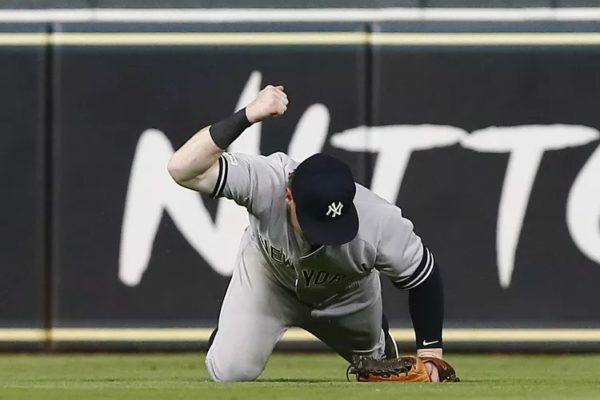 The Yankees are in trouble.When you have Didi Gregorius, Aaron Hicks, Giancarlo Stanton and Miguel Andujar out of your lineup, it’s hard enough to overcome. (Even the loss of Troy Tulowitzki is problematic because it means Tyler Wade needs to play.) Couple those injuries with being 5-7, having gone just 5-4 against the Orioles and Tigers and you have a recipe for disaster. The Yankees’ remaining April schedule is still very favorable as they have two games against the Red Sox and the rest of the month they will play against very bad to mediocre-at-best teams. That’s good because the current Yankees lineup is mediocre at best, but it’s bad because these are games they are supposed to win and games they need to win for the final standings. The Yankees were supposed to build a lead and get fat off their April schedule, instead they are looking to play .500 baseball. To be completely honest, I would sign up for the first wild card right now. That’s not an overreaction or me giving up on the season. I know we’re seven games into the season, but none of the injured everyday Yankees are expected back any time soon. Gregorius’ best-case scenario is the All-Star break. Hicks just started baseball activities, which means he’s a few weeks away. Stanton isn’t close and season-ending surgery is still in play for Andujar. The Yankees have already exhausted their depth and batting Tyler Wade and Mike Tauchman is basically the equivalent of playing shorthanded in a Central Park softball league and having to take automatic outs at the end of the batting order. Everyone keeps talking about the Yankees’ need to stay afloat until they can get healthy, but they aren’t going to be healthy for a long time. At least if they were guaranteed the first wild card, they would most likely be healthy by then. 2. Everyone keeps talking about the Red Sox’ 3-9 start as if it’s some consolation or an excuse for the Yankees’ poor start. The Red Sox’ atrocious play has nothing to do with the Yankees and the last thing the Yankees or Yankees fans should be concerned with. They steamrolled the Yankees in the playoffs and won the World Series. They can finish in last place this season for all it matters. The Yankees and Yankees fans should worry about themselves. The Red Sox aren’t even the biggest threat in the AL East. At least not right now. The Rays are 10-3 and there’s a good chance they could be 13-3 after this weekend against the Blue Jays since they apparently know how to take care of business against crap teams. The Rays have the reigning AL Cy Young winner in Blake Snell to go with Tyler Glasnow and Charlie Morton, a dominant opener strategy and a lineup full of nobodies who only gets hits and hit home runs when there are men on base. The Rays are for real and they aren’t going anywhere. The Yankees are 4 1/2 games behind the Rays right now, so if you’re going to worry about or focus on another team’s play, it should be them, not the Red Sox. The bullpen has blown leads, increased deficits and been a major problem through the first 12 games. Yes, it’s only 7.4 percent of the season, but what was supposed to be the team’s biggest strength is far from that. The Yankees have had a lead in 11 of their 12 games and are 5-7. 4. I trust Joe Harvey right now more than I trust Tommy Kahnle or Stephen Tarpley, and he has 1 1/3 major league innings to his name. Unfortunately, Harvey is going to be the odd-man out when CC Sabathia is activated this weekend. Kahnle and Luis Cessa are out of options, so they are both staying, and the Yankees seem to love Tarpley, even though they have two other left-handed options in the bullpen. 5. I wonder if the Yankees and their pitching staff will ever figure out how to pitch to Jose Altuve. The free-swinging former MVP destroys fastballs and his miniature stature has no impact on his ability to hit them a long way as he showed by hitting four home runs in the Astros’ three-game sweep of the Yankees. Altuve is looking for a first-pitch fastball, and if he gets it, he’s swinging and it doesn’t matter where it is. So if your strategy for some reason is to throw him a first-pitch fastball, it would be ideal to not put it middle-middle for him to send to the MinuteMaid Park train track. 6. Last year at the trade deadline, I called James Paxton “blah” and in the same category as Chris Archer and Michael Fulmer, pitchers who I didn’t think were worth trading for since they wouldn’t really make the Yankees that much better. It was hard to find anyone who shared my perspective. Paxton has been underwhelming at best in three starts as a Yankee with two of those coming against the Orioles. His season line: 15 IP, 20 H, 11 R, 10 ER, 6 BB, 19 K, 3 HR, 6.00 ERA, 1.733 WHIP. My biggest problem with the Yankees acquiring Paxton wasn’t his performance since he has always pitched well, it was the fact he has never pitched more than 160 1/3 innings in a single season and is good for at least one injured list trip per season. So now not only do I have to worry about Paxton’s seemingly inevitable injured list stint, I also have to worry about his actual performance. If Paxton had gone to the Astros, there’s no doubt in my mind he would be a Cy Young contender, the way the Astros revitalized Justin Verlander’s career, enhanced Gerrit Cole and figured out how to make Charlie Morton nearly unhittable after a career defined by inconsistency. The Yankees have a reputation of being able to add velocity to their pitchers, but outside of that, any pitcher they acquire through trade or sign as a free agent in the Brian Cashman era hasn’t been able to duplicate their success in pinstripes, other than CC Sabathia (and he was awful for three seasons) and Masahiro Tanaka. Paxton started against the Astros four times in 2018 and went 4-0, allowing six earned runs in 26 1/3 innings (2.05 ERA). He puts on the Yankees uniform and suddenly he allows 11 baserunners in four innings and needs 95 pitches to get 12 outs against the same exact team he dominated last season. Paxton has another 28 or 29 starts this season, if he stays healthy all season, which he has never done in his baseball career, and there is a lot of time for him to turn it around. It’s going to be a sad day if Justus Sheffield turns into a true front-end starter in the majors and Paxton is anything other than a No. 2 for this team. Over the last 17 days, Sanchez has had eight games at catcher and two games at designated hitter. He’s had a complete week’s worth of rest through days off in the 17-day period. If Sanchez isn’t in the lineup every game this weekend against the White Sox with another off day on Monday, it better be because he needs to be placed on the injured list. 8. The Yankees don’t just have a mediocre lineup, inconsistent rotation and untrustworthy bullpen right now, they are also the worst fundamental Yankees team I can ever remember. Wild pitches, passed balls, throwing errors, fielding errors, nonsensical bunt attempts with runners on first and third and no outs in the second inning of a game, not running out bunts, misreading line drives, diving for balls and turning outs into singles and singles into doubles, outs on the bases and being unsure of what base to cover as a result of infield shifts. I’m sure I’m missing even more elements to the team’s embarrassing display so far this season. 9. DJ LeMahieu is quickly climbing the list of Yankees I want up in a big spot, and I think right now he’s second only to Aaron Judge. LeMahieu is everything no other Yankee is at the plate as he doesn’t look to hit the ball 500 feet with every swing, he changes his approach as the count changes and he allows the situation of the inning to determine his at-bat. It’s beautiful to watch. And oh yeah, he plays a Gold Glove second base and has been a vacuum at third base. The injuries are certainly a big reason why the Yankees have been as bad as they have been in the early going, but the Rays don’t care. They are going to keep winning games with incredible pitching and timely hitting. The Yankees are 4 1/2 games back right now. Last year, it took them winning 18 of 19 to overcome their early-season deficit to the Red Sox, and then once they were unable to keep up their historic pace, they went right back down in the standings. It might still be early with 150 games left in the season, but the deficit in the division, no matter who it’s to, can’t keep growing at the current pace. It could take months to erase a six- or seven-game hole. The Yankees need to get back the roster they anticipated having for this season and everything should be fine. But first, they need to start winning series with the roster they have.